Over the past four years I’ve worked on this website as well as my freelance business. To say that my income growth has been slow and steady would be absolutely correct. Well, until last month, that is, when I made almost double what I’ve been averaging for the past year. If you would’ve told me four years ago that I’d go from making $1,800 per month to more than $10,000 in a month I probably wouldn’t have believed you. Heck, I wouldn’t have believed you if you told me I was going to earn $5k per month. At the time those numbers felt so far and away. But lo and behold I’ve finally reached my very first five figure number and you may need to pinch me because I still can’t quite believe it! Instead of doing a regular income report for this month I thought I’d break things down into more detail to show you all of the sources of income and how those work for me! When I first became self-employed almost all of my income came from freelancing. 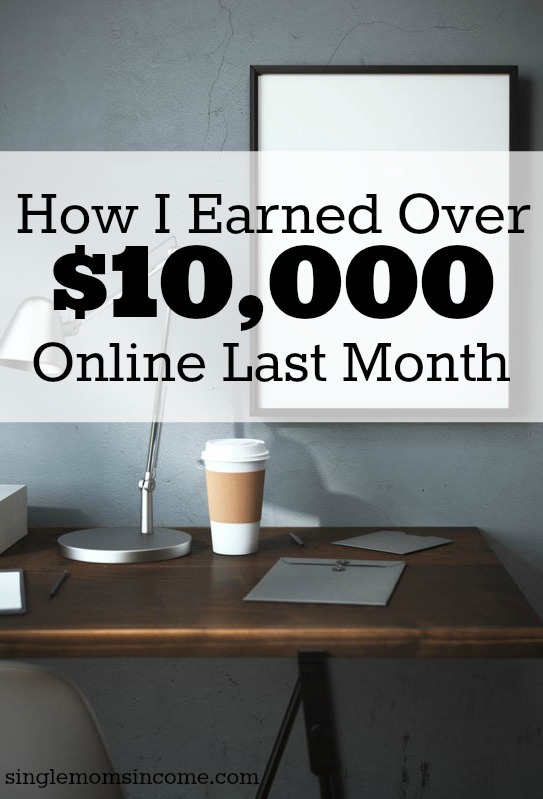 I created this blog and chronicled all the different things I was doing to earn money online to keep myself on track. While I had tried many different money making ideas (you can see a list of early failures here) writing for other blogs is what seemed to stick. About a year after starting this blog in 2012 I was making enough money from freelance writing, which was only around $1,800 per month at the time, to quit my job. Since I always earned a fairly low income and had stashed away enough money in an emergency fund to fall back on, I was comfortable going full-time when I hit the $1,800/month milestone. 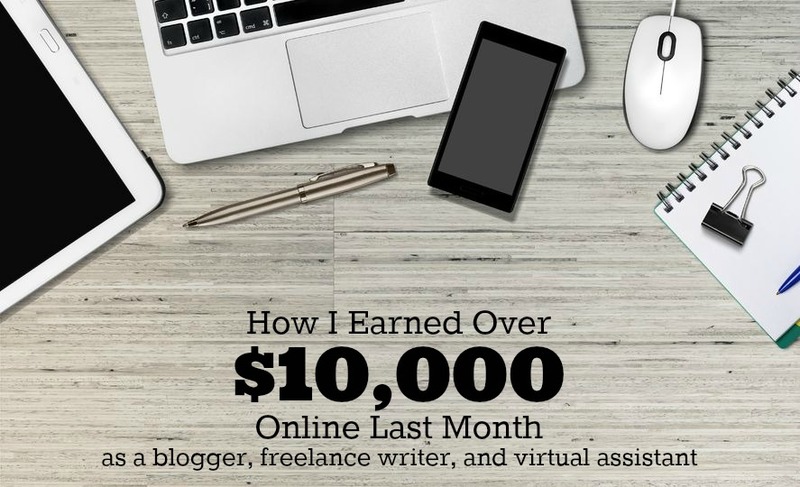 I still do a little bit of freelance writing and virtual assistant work for some of my earliest clients, which is where this figure comes from each month. If you’re interested in becoming a freelance writer I have a step-by-step guide detailing what worked for me when I was just getting started and had no experience: How to Find Freelance Blogging Jobs When You’re Starting From Scratch. I do many different things as a virtual assistant including scheduling posts in WordPress, creating graphics and scheduling social media posts. If you’re interested in learning more about virtual assistant work here are over 30 services you can offer as a VA.
Blogging is where the bulk of my income came from in May. Increasing my blogging income has been a slow but fun journey. This month is higher than it typically is, mostly due to the timing of payments. A lot of the money I make from blogging can take 30-90+ days to receive. This month a slew of payments all happened to come in at once. If you’re interested in starting a blog here’s how to do it. I even have a special discount link for my readers to get Bluehost hosting for as low as $2.95 per month PLUS a free domain name. Here are the income breakdowns as well as further explanations of these income sources. (P.S. If you currently have a blog but are having trouble building traffic or making money you can get Ruth Soukup’s free e-book 7 Ways to Boost Your Blog Income Overnight for free here.. Ruth is the creator of Elite Blog Academy which is the course that helped me 10x my traffic and income. Affiliate sales occur when I post a special affiliate link (many times that will get you a better deal than normal) and I earn a commission when someone clicks through my link and signs up for a service or purchases a product. I only promote companies that I personally use along with courses I believe are really beneficial and offer a lot of bang for your buck, like Elite Blog Academy or Bookkeeper’s Business Academy for example. For May my income from affiliates was strong due to receiving payment from a couple of courses I had recommended months ago. Again, these were courses I believe to be great and very beneficial to anyone who takes them and really applies what’s been taught. My affiliate income has been getting stronger and I predict that this will be a good source of income for me next month as well. Ad networks would be the ads you see on the sidebar of this blog. These ads go to third party websites and I get paid either when someone clicks an ad or just visits my website. Over the past year my income from ad networks has grown and then finally plateaued. I use three different ad networks on this blog: Google Adsense, Media.net, and the Blogger Network. If you have a blog and are interested in earning more with your ads I have a breakdown on what has worked the best for me. You can find that post here. Sponsored posts are posts that I write in partnership with a company. (Example.) I am very selective when it comes to sponsored posts and I pass up on around 90% of the opportunities that come my way. As a blogger or online business owner creating your own products like guides, ebooks and courses is a popular way to earn money. I only have one product, an SEO guide for bloggers, which I rarely promote. The guide costs $9 so obviously, I made one sale in May. When you tally up all the different income sources for May the total comes to just over $10,000. I’m still a little bit in shock, but also feeling super grateful. I am so glad that four years ago I decided to start this blog and was crazy enough to believe that I could make it work. That belief, a lot of hours writing, and support from all of you has been what’s made this possible. Thank you! This month was quite a bit of progress but I think it will dip back down a bit for June. Congrats, Alexa! That is awesome. It’s a testament to your hard work and dedication! Good for you. I have not been able to monetize more than a couple hundred bucks per month lately so I really have no idea how all of you are doing these huge amounts. Hats off. Thank you! I’m still a bit surprised by it too and best of luck to you. Happy dance for you! So happy you made your first five figure month. I like how diversified your income is and I’m working hard at doing the same. You’re really an inspiration and congrats on all that you accomplished! Congratulations Alexa! I’m so happy for you. You’re truly an inspiration!! Yowza! You used to live on that for almost 6 mos !!! Very cool. You deserve it. Thank so much, Christie! I think I could still (almost) live on that for six months. It’s pretty shocking to me still…..kind of sureal! I remember reading your first income reports. It’s great to see how you have grown your business. Thank you 🙂 I’ve certainly come along way since those first reports. Wow, what a milestone. I can’t believe it’s been 4 years already. Whenever I talk to people (often single moms like me) who are struggling or looking for ways to increase their income I always direct them to your site. Because I have been following you for so long I always say “You need to check out my friend Alexa online”. You share so much of yourself I feel like I know you (not in a creepy stalker way, I promise). You’ve inspired me to start my own side business and I am using a lot of the lessons you have shared to help build this. Can’t wait to see what the next 4 years bring. Wow, so inspiring! Thanks for sharing, I love reading the monthly reports from bloggers, it makes me think that maybe someday I can earn money too. Congratulations! I am so happy for you. Always an inspiration to me to keep going. Last month I finally made over $2K. You are so right slow and steady seem to be the thing for me. Keep up the good work Alexa and thank you! Congratulations, Alexa! So inspiring! Thanks for publishing these. Great post really well done! I can only hope to be making this sort of money soon!! Great ways to make money. Thank you! Thank you for the information and congratulations on making it to the 10k mark, that is just amazing to me. I appreciate your honesty in sharing this information with us and hope you continue to do so. I am so new to blogging that every little bit of information I can get is super useful. I will be checking out the ebook you listed as well as the eliteblogacademy, which I have heard about several times no but I have yet to look into it. Thank you 🙂 And best of luck to you as well! I have been following you for a couple of years and took a hiatus from all my blogging stuff for a while. I come back on here and your making this much! I remember you 1,000-2,000 income reports. So proud of you! This is absolutely amazing! I am a single mother myself and to see someone like you succeed this way definitely gives me higher hopes for myself and what I can accomplish! I enjoy reading all of your content; as a matter of fact I have used a lot of it in my journey to being a stay at home mom! Thank you! Just found your blog, and this is super helpful! Thanks!